An affordable tester that's actually easy to use? The Mistral Keypad Test System has been designed to be the least expensive, easiest to use full featured tester for membrane switch assemblies. The idea is to combine a small, smart "pod" with a PC running software that makes full use of the Windows® graphical interface. Make it as easy to set up and use as possible yet include all the features you need. And make it inexpensive enough that you can afford to buy the Mistral Keypad Test System and a new PC (even a laptop) for less than the cost of some competing systems without their required computers. 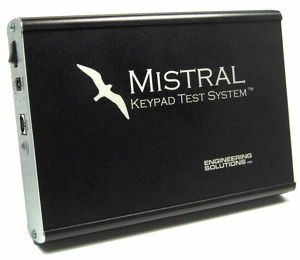 Mistral is the successor to our popular Stingray Keypad Test System. We've significantly increased testing speed (up to 10 times faster) and resistance measurement range (from 10M Ohms to 20M Ohms). The biggest change is how we handle LED testing. You can now specify LEDs just like the manufacturers do, with forward voltage and reverse leakage current. So compare the Mistral Keypad Test System to any other keypad tester on the market. We think you'll like what you see.